it’s been a while again . . .
Well, I’m still struggling with the M.E. Saw the doctor today, and he wants me to have a full blood test to make sure there’s nothing else going on. Today I actually managed to get up and dressed (obviously, went to the doctor! ), then to Boots, Halfords and Hobbycraft for various bits and bobs. But got back absolutely exhausted and gaga. After all that hot weather, we’ve finally had some serious rain. Not enough, though, I don’t suppose. 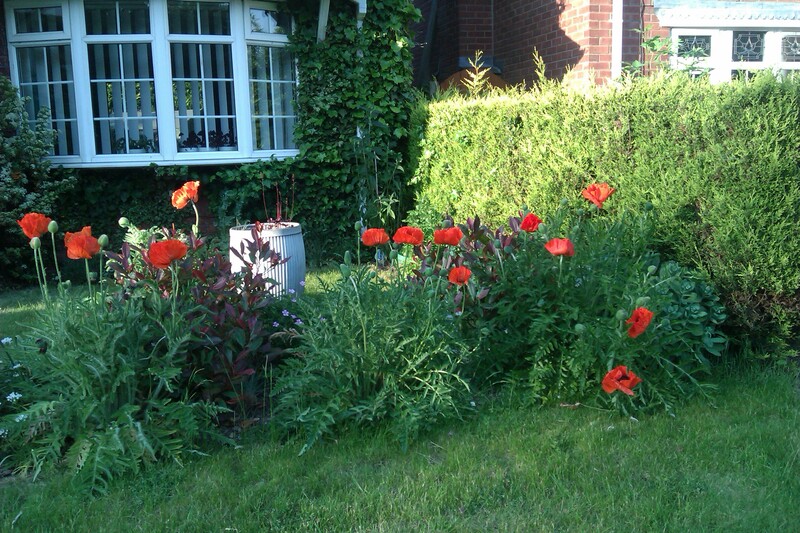 Meanwhile, the poppy plants I grew from seed have exceeded my wildest expectations. The rain might have battered them a bit, but people are actually stopping to look! Love it. ED took me to Springs Hydro Spa for a pampering day on Saturday, which was just wonderful. I had an exfoliating massage and a facial. Lovely. Tomorrow – dentist. Then blood test. Then home, sleep, then possibly Stitch, depending on how I am, but I really do like to go there. I have started having a cup of iced herbal tea, which is very nice indeed, and am hoping there will be some of the hazelnut and chocolate dairy-free cake they sell. Made a dairy-free fruit cake – it’s just dried fruit, orange juice, and flour. You soak the fruit in the orange juice overnight, then add the flour and stick it in the oven. I froze it in slices because nobody else except me likes fruit cake. It’s absolutely delicious. Thank you Deb for the recipe! (google dairy free fruit cake). The new chocolate regime is working. Instead of getting through approximately half a kilo of chocolate a week, I make 200 gms last 7 days instead. And have lost half a stone (3 kilos). Feeling much better about it all. And I get to eat chocolate Every Single Day. To be honest, I haven’t really recovered since Mother’s Day Out. It was wonderful, but has left me absolutely exhausted. ED is up today from Southampton, doing things with YD, and they’re both coming here for lunch. It’s wonderful to see them both, but I don’t even have the energy to shower and dress. Currently wearing old paint splattered t-shirt and matching – well, actually, non-matching but equally paint splattered – old combat trousers. Feels like I have had flu, and this is the aftermath, when every time you walk into another room, for example, exhaustion and achiness floods everything. Am sleeping a lot. A Lot. But it will pass, if I get enough rest. The knitting is going ok, despite pain in both hands now. I have a follow up appointment at Warwick Hospital on 20th July, so will see what they say. I knit for a little while, then rest, then knit some more. In the process of making some doll clothes for one of the granddaughters – then there’s another four things to knit for the other grandchildren. All planned, resourced (from my stash and the Ravelry website), and sitting waiting in the “Projects Waiting To Be Done Next” bag. There is a wardrobe full of “Projects Waiting To Be Done At Some Stage” upstairs, and I have to confess to ordering yet more yarn – well, it was so heavily reduced, and is such lovely yarn, it would have been Rude Not To! Ooh. Have made contact with the Solihull Town Twinning Association (as that is how, indirectly, I came to know Rejane), and had a sort of “interview” type meeting over a cup of tea with the Membership Secretary. She thinks I’m young! Ha! 57! but is keen to encourage “younger” members. Interesting. Will stop now. Didn’t mean to moan, but feel a bit better now I have!